Pirate's Ark is a pirate-themed air hockey table for kids. 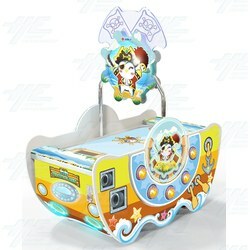 Certain game features such as a lighted table surface and lifelike sound effect and dynamic effect are designed to attract players. Speed can be adjusted based on the need of customers. Tokens can be inserted at either ends. 1. It is a sport-style machine. Players especially parent and child can play together to improve relationship and exercise physically and mentally. 2. Player inserts tokens to start, place the plate ball on the table, use the pusher to push the ball into the other gate to win.